Where Do Baby Yeasts Come From? Fermentation is a wonderful and yet almost magical thing. Have you ever been to a winery or brewery and marveled at the vast array of carboys, all with a constant flow of bubbles rising up along the sides? At the smells of floating yeasts, knowing that right in front of you there are tiny microorganisms dutifully converting sugars into alcohol? Well, this process is not nearly as difficult or intimidating as it seems. And in fact, once you get a hang of it, you can easily whip up a homebrew and let it sit while you continue living the rest of your life. The homebrew takes care of itself without needing any help from you, aside from the occasional check and racking off — more on that later. In this article, we'll go over how to make some homebrew wine, which is basically the simplest form of homebrew you can make. Beer is a bit more complicated, and distilling is another thing altogether, but once you understand the principles behind all of this you can make delicious wine that your friends will love. First, let's break down what exactly happens inside of all those carboys, and even what's going on inside the bottles of beer that are sitting on your shelf at home. So, all around you right now, floating everywhere, are tiny microorganisms called yeasts. They're the same thing used to make bread rise, broken down into different strains, all of which have different qualities. One of the qualities is the tolerance it has for living inside of an alcoholic environment. There are some strains of yeast you can purchase, for example, that can tolerate alcohol levels of up to 22%. Yeasts eat carbohydrates (which, for our purposes, would be in the form of sugars) and excrete both alcohol and carbon dioxide. The carbon dioxide is what makes up the bubbles found in champagne and most beers. The wine you buy is typically not fizzy because the producers kill off the yeasts before they bottle it. So what making alcohol comes down to is getting some yeast, providing it an environment in which to live (liquid) along with some food to eat (sugar), and then just letting it do its thing. It will happily swim around, propagating itself, eating sugar and creating alcohol and carbon dioxide, until it either runs out of sugar to eat or, ironically, has created for itself an environment too alcoholic for it to be able to survive. Now, when you talk to most people about “wine” they typically mean “wine made out of grapes”. “Beer” usually means “beer made out of barley”, etc. But in reality anything with sugar can be fermented. I've made wines out of crushed and squeezed apples (cider), honey (mead), cantaloupes, strawberries, and even chocolate cake! You could also put together a sugar-water solution and add your own flavoring, such as mint, tarragon, cinnamon, or even Jolly Ranchers. The only limit is your imagination! So where do we get these yeasts? Well, one cheap and simple solution is to go to a brewing shop and purchase packets of it. The kind that I use is made by a company called Lalvin. They're very cheap and an almost guaranteed success in creating something of good quality. Another, even cheaper method is to capture some wild yeasts yourself. As was mentioned before, yeasts are floating in the air everywhere all the time. They love sugar and will be attracted to it, so what you can do is mix up a sugary solution and leave it to sit for a few days, covered by a towel or t-shirt to keep out dust and flies. Check on it every day, and one day you'll notice that there will be bubbles around the edges of the liquid. That's the yeast, having spotted your delicious creation and gone for it, eating sugar and making carbon dioxide. This is the same process for when you make a sourdough starter for bread. One note on leaving these liquids out in the air, though: along with wild yeasts are a bacteria called Acetobacter, and they are attracted to alcohol and convert it to acetic acid, or vinegar. This is how you make vinegar, in fact: take some alcohol and leave it out, and the Acetobacter will latch onto it and do its work. However, drinking vinegar is typically much less pleasant than drinking wine, so just be careful if you're leaving things out. An airlock. As mentioned before, Acetobacter will definitely get your alcohol if you leave it out to the air. So what you need is an enclosed container, but one that has the ability to release the built-up carbon dioxide while, at the same time, not allow air back in. This can be done in a pinch with a loose-fitting lid that simply falls back onto the container you're brewing in, but a more reliable method is to use water. An airlock is a contraption that allows air to bubble out through a bit of water, but due to the properties of water, air can't get back in without being forced in. It's the same principle for how the U-bend of a toilet or sink works. Airlock can be purchased at any brewing store, or you can make one yourself by feeding some plastic tubing into the opening of your container and bunging it up with something (plasticine, a handkerchief, etc.) Take the other end of the plastic tubing and put it into a glass of water. Voila! Carbon dioxide will be forced out through the tube into the water, but air won't be allowed back in! Ultimately, that's everything you need to make up some homebrew wine. One other bit of equipment that comes in handy is a length of plastic tubing, but this one with a stiff section on one end. You see, what happens while the yeasts in your container are swimming around, living their lives and doing what they do best, some of them naturally die off and float down to the bottom. There might also be some residue of whatever it is you've decided to ferment (if you'd crushed and strained some fruit, for example). All of this adds up to sediment at the bottom and, like the mud in a swamp, it can fester in its anaerobic environment and create foul tastes. So what we need to do in this case is rack off the wine. When you notice that there's a decent amount of sediment built up on the bottom of your vessel, take off the airlock and feed the hard end of the plastic tubing down to just above the sediment. Siphon the liquid down into another vessel or a bowl or a pot — something to hold the liquid, basically. I know I mentioned before about Acetobacter and what could happen if you leave your alcohol out, but you'd need to leave it for a few hours for the bacteria to have a chance to get to it. The half-hour it could take to rack off your wine shouldn't put it into any danger. Take in as much liquid and as little sediment as possible. The sediment is like silt, so some of it is bound to come up as you're doing this, but don't sweat it. When you're done, take out the tube, empty the remaining liquid into a jar to drink or keep (it's already alcoholic so you can try it out, and the yeasts actually contain a lot of Vitamin B! ), rinse out the vessel (giving it s scrub if you need to) and put the good stuff back into it. The liquid level has probably gone down a bit, so top it up with some juice or water or sugar-water. 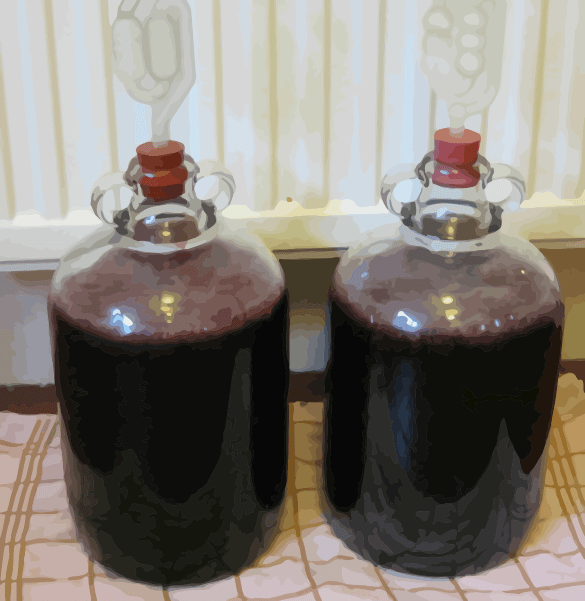 Okay, enough preliminaries… let's make some wine! Get your liquid. You're going to want enough so that, mixed with the sugar, it will fill up your fermentation vessel to about an inch or two from the top. This is called headspace. If you don't have enough headspace, then when the yeasts start out they're going to foam over. If you have too much headspace, however, there's more of a chance of having captured some Acetobacter and you could inadvertently make vinegar. An inch or two from the top should be fine, though. Remember that you can make wine out of anything. Some of it may taste better than others, and some things may seem weird to try out, but there is no wrong answer here. If you want to start off easy, I would suggest some fruit juice. Apple juice wine is delightful, for example. Mix your sugar into it until it's dissolved. The easiest way to do this is to heat up some of your liquid and melt the sugar into that — sugar mixes less easily when it's in cold liquid. Once that's dissolved, pour it back in with the rest of the liquid and give that a stir. Most recipes call for 2 lbs. of sugar per 1 gallon (4 litres) of wine. Less sugar will mean less alcohol, and more sugar will mean a (potentially) sweeter wine, if the yeast die off before they can eat it. Try things out and see what works best for you. If you're going to use wild yeasts, leave your solution in an open-air vessel (like a bucket) and cover it with a towel or t-shirt or cheesecloth. Leave it for a few days until it's bubbly, then pour it into your fermentation vessel. If you're using commercial yeasts, pour your solution into your fermentation vessel and open up the packet, priming it as per the instructions. This just means waking up the dried yeasts by suspending it in some water until it's all bubbly. Give it a stir and pour it into your solution. If you already had the headspace at a decent place and more liquid would make it too high, prime the yeast with some of your liquid. Now wipe around the lip of your vessel in case you spilled some (which I always do) and put in your airlock. That's it, you're done the first step! Pick up your beautiful creation and put it in a place where it's not in direct sunlight, but is still kind of warm. After a bit (like a few hours) you should notice it getting extremely bubbly. It's fascinating! You might want to keep it in a bowl, though, in case it foams over. More than once I've had my wine foam over and actually push itself through the airlock. If this happens then don't worry about it. Wait a day or two for it to settle down, then take the airlock out, rinse it off, and put it back. After a week or two you'll notice some sediment down at the bottom. It's suggested that you rack off your wine to get that sediment out. If you leave it the sediment could impart a bad taste to the finished product. Simply siphon the wine out, leaving the sediment behind, pour the sediment into a jar to keep or drink, rinse out the vessel, and put the wine back. Easy-peasy! Once the bubbling has stopped, the yeasts are all done their work and your wine is done! Siphon it out into wine bottles, pop bottles, Mason jars, anything. Siphon some into a glass and have a taste. Enjoy your creation! You can do it again and again, and you're free to change things up however you'd like! It's entirely up to you! If you don't feel like drinking a huge amount of alcohol right now, a good idea would be to bottle your wine and leave it to age. Aging mellows the wine out and gives it a nicer flavor. You could do this in pop bottles or old beer bottles with a capper, or wine bottles that you can cork (or, if it's a screw-top wine bottle, just re-use the top that came with it). Leave them in a dark, cool place for a few months, a year, a decade, whatever. Aging turns good wine into great wine. Well, I hope you enjoyed this! If you have any questions, feel free to contact me, or check out the book Wild Fermentation by Sandor Ellix Katz. It's the one I used to first learn about fermentation, and it's incredible.